As parents and children around the country gather with relatives to celebrate the holidays, our national conversation often focuses on common experiences. Families from different economic backgrounds repeat rituals of shopping, opening gifts and sharing meals. If middle-class people do pause to recognize the differences in the way we celebrate the season, they often emphasize what poor and working-class children may be missing. Will they have enough toys under the tree? Will their holiday feast be bountiful? What these people fail to realize is that their own children could benefit from some of what children from low-income families experience. For during this holiday season, poor and working-class children will celebrate with relatives who know them because they share daily pleasures and disappointments. They talk on the phone frequently and visit during the week. For many working-class and poor families, extended-family visits are the organizing principle of social life. According to the 2002 General Social Survey by the National Opinion Research Center at the University of Chicago, 41 percent of poor and working-class people spend a social evening with their relatives often, from once a week to as much as every day. For many middle-class children, however, visits with relatives are infrequent. Instead of spending time with aunts, uncles and cousins, hectic schedules of soccer games, piano lessons, basketball practice and other activities are the organizing force of daily life. According to the General Social Survey, about half of middle-class people see their relatives for social evenings once a month or less. Clearly, some have moved away from their relatives or, with today's smaller families, simply have fewer cousins. But for many, it's a matter of not having the time. In my own research, I have watched parents rush home from work, urge children to hurry up and change into a sports uniform, race to get one child to a baseball practice at 6:45 and another child to a soccer game at 7:15, all the while contending with tired younger siblings who must trail along. Weekends can mean traveling far from home to compete in tournaments. Indeed, this situation is probably familiar to many middle-class parents. As a result, their children are deprived of the pleasure - and sometimes the burden - of spending time interacting with their extended families. They do not share food, rides or companionship with their cousins. They are not routinely disciplined by their aunts and grandparents. They do not see their cousins so often that they come to be like brothers or sisters. Instead, they see their relatives only in their holiday clothes, using their holiday manners, and maintaining their holiday style of interacting. There are other drawbacks. The demands of many of these so-called leisure activities are akin to the rigors of school, as children are given directives, told to hush, evaluated publicly and instructed in how to improve their performance. On the other hand, children with fewer formal activities tend to have less pressure placed on performance and more time for informal play and simply being a child. There are undeniable advantages for children born into the middle class, especially when it comes to educational success, health care and housing. But while these benefits are powerful, and the costs of being poor and working-class are formidable, we still make a mistake when we presume that being middle class is uniformly better. Social class has an invisible, but potent, impact on aspects of American life. Too often, the better-off view those who have less than them only in terms of what they can offer, or even teach, the poor. During this holiday season, it would do many Americans good to consider what they can learn from the poor and working class about family, connection and taking time to be. Annette Lareau, professor of sociology at Temple University, is author of "Unequal Childhoods: Class, Race and Family Life." AVOC COMMENT: This is an interesting article. It does seem that children are "so organized" nowadays that they do not have time to relax and be children. Children's schedules are a frequent challenge in Custody and Visitation conflicts. In past decades, our nation was more rural and many of its leaders came from a farm background. That type life does allow more personal and "thinking time". For the last couple of decades, many kids are involved in competitive sports so much that they have a limited perception on life. Growing up on a farm of the 40's and 50's, I personally walked around the neighborhood (closest neighbor was 1/2 a mile) and sold greeting cards and garden seeds. Some of my fondest childhood memories were the kindnesses of neighbors. We were involved in Church activities, playing with cousins on Sunday, eating "Sunday Dinner" at Mama Hassie's house. 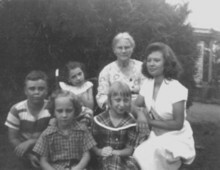 Spending time with older relatives and neighbors was a common occurrence. After "laying by time" some of us boys would dam up the pasture branch for a summer swimming hole. A weakness in our society of today is the loss of sense of family and a sense of community. Many of us are transitory. We do not "put down roots". We want or demand services and entertainment. We are becoming a society of "takers" as opposed to "givers". In time, our society will be weakened because of the lack of altruism and dedication to causes or community as we become more of a selfish society and "dog eat dog". Hope springs eternal! Maybe a future generation will be interested in something besides youth softball, baseball and soccer and the like. They may discover a world that current persons are not aware of.